I gave opening remarks at the Transparency Research Workshop hosted by the Institute on Transparency and Governance in the School of Public Affairs and Administration at Rutgers University Newark on September 22. I gave the keynote speech to the International Conference of Information Commissioners in Manchester, UK on September 20, 2017. The title was “Defending the open society.” Text for the talk available here. The meeting was hosted by the UK Information Commissioner, Elizabeth Denham, and the Scottish Information Commissioner, Rosemary Agnew. More information about the conference here. I participated in a panel discussion on the future of access to information at the Canadian Bar Association’s Access to Information and Privacy Law Symposium in Ottawa on October 28. The program is here. The panel included Michel Drapeau, Murray Rankin MP, and David Loukidelis. I’m quoted in a July 29 story by Radio France Internationale on WikiLeaks. Read the story. I provided a skeptical view about WikiLeaks’ impact in a 2011 article in the Wilson Quarterly, The WikiLeaks Illusion. Read the 2011 article. A longer academic version of that article also appeared in the International Review of Administrative Sciences in 2012. Read the 2012 article. I’ll be a presenter in the Technology for Accountability Lab that will be hosted this summer by Stanford University’s Center on Democracy, Development, and Rule of Law. Details here. I was pleased to help with hosting a debate on open government at the Reynolds Journalism Institute on March 15. Video of the debate here. In a February 25 speech in Dublin, European Ombudsman Emily O’Reilly discusses my address to Mexico’s Accountability Network last October as well as earlier work on the effect of Wikileaks. A note for Sunshine Week, March 15-21, 2015. Louis Brandeis is credited with writing that “Publicity is justly commended as a remedy for social and industrial diseases. 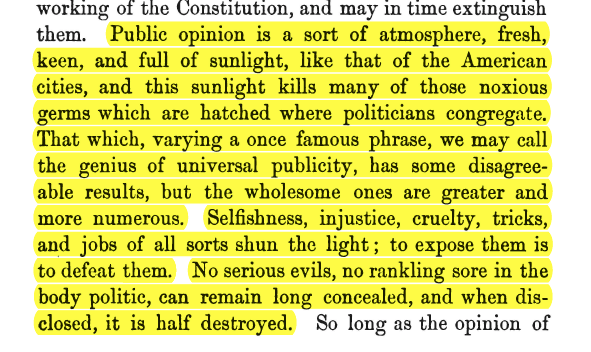 Sunlight is said to be the best of disinfectants; electric light the most efficient policeman.” But why did Brandeis say that sunlight is said to be the best of disinfectants? Because he was referring to a statement by James Bryce in his 1888 book, The American Commonwealth. In light of the just-released report on CIA torture, this 2012 book chapter, “Open Secrets and Dirty Hands,” might be of interest. “Complaints about secretiveness were commonplace throughout the presidency of George W. Bush. Such complaints overestimated the capacity of a contemporary President to maintain secrecy. Moreover, they overlooked the reality that information about the worst abuses of the Bush administration was generally accessible to the public. We professed ignorance about governmental kidnapping, indefinite detention, and prisoner abuse, even though details about such practices were readily available.” Read on SSRN. 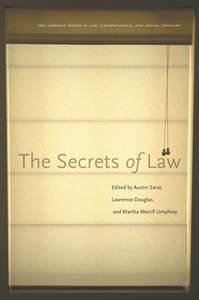 This chapter was published in The Secrets of Law (Stanford University Press, 2012). Kevin Wagner reviewed the book for Law and Politics Book Review in March 2014. “Alasdair Roberts’ ‘Open Secrets and Dirty Hands’ is an excellent look back at the secrecy conflict during the Bush Administration. He effectively presents the idea of a willing ignorance as a complicit element of perceived government secrecy.” Read the review.